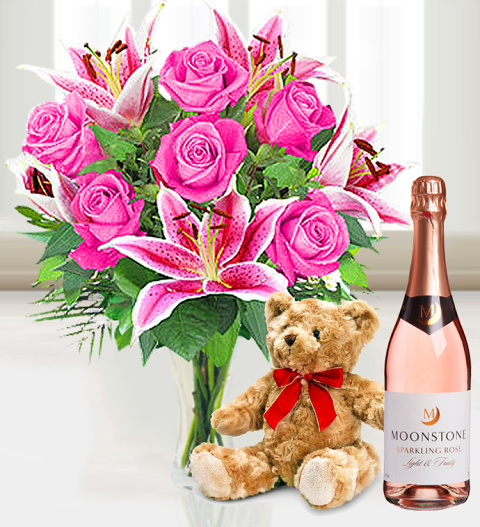 This hand tied bunch of pink roses and lilies make the ultimate feminine gift. Stargazer Lilies offer a bold appearance and inviting perfume. Accompanied by sweet gypsophila and reobellini palm leaf, this bouquet is fit for all occasions. This bouquet comes with a cuddly bear, a 50g box of luxury Belgian chocolates, and a 75cl bottle of Sparkling wine. This flower arrangement is arranged by our expert florists and available for UK next day delivery. Kindly note that the Lilies may arrive in bud form so as to increase the life of this bouquet. Chocolates may contain nuts.